Head back through Cerulean City to Route #9. Go to the edge of the river in the northeast corner and use Surf to dive into the water. Paddle south until you reach land, then climb out and enter the Power Plant to search for Zapdos, one of the rarest Pokémon of all. Be warned that some of the items strewn across the floor are actually disguised Pokémon. There's a Zapdos waiting near the Power Plant exit. If you wish, you can defeat it to earn experience points, but since this is the only time you'll even see a Zapdos, we recommend trying to capture it. This Pokémon is extremely difficult to snare, even if its energy is nearly gone, and typically nothing less than an Ultra Ball will do the job. Putting Zapdos to Sleep will increase your chance of trapping it. You don't have to beat the Power Plant to win the game, but the single level 50 Zapdos at the end is incentive enough to make this short dungeon a must-visit before you challenge the Elite Four (and Red players won't want to miss their exclusive Electabuzz). Another good reason is TM 25 which contains Electric's power technique, Thunder. To get to the Power Plant, Fly to Cerulean City, then head east until you get to the river part of Route #9. Use Surf, and you'll find the plant with little trouble. A Pokémaniac waits outside the plant for any challenger with his Rhyhorn and his Lickitung. Beat him to earn 1500. There's only one floor, but the enemies can be tiring. Use a Max Repel or bring a lot of Grass and Ground-type Pokémon. Dig is especially good, taking out just about anything in one hit. And remember, all that glitters is not gold... Most of the item balls that you come across in the Power Plant are actually Voltorbs. Only pick up the ones that are marked as items on the map! 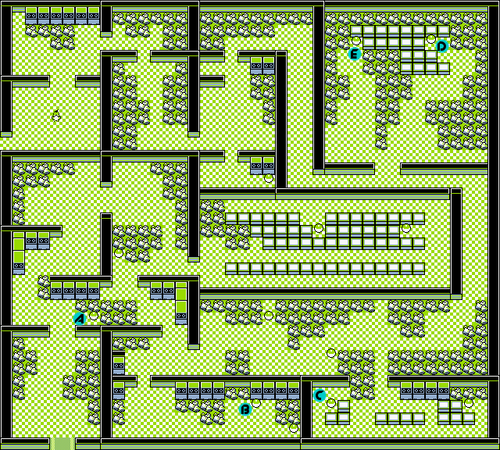 There's also a hidden Max Elixir in the "middle" rectangular room if you go into the dead end all the way around the boxes, and a hidden PP UP in the dead end two rooms before Zapdos. and can be caught like any other wild Pokémon. Just as Blue got Magmar exclusively in the Pokémon Mansion, Electabuzz only exists in the Red version, in this area, and in small quantities. Unlike Magmar, Electabuzz is pretty good. Not as good as Zapdos or Jolteon, but if you want to go crazy with the Electric-types, you'll find Electabuzz's Speed and powerful techniques a welcome addition to your team. Zapdos is incredible. He starts at level 50, learns the most powerful Electric technique (Thunder) at level 51, and he has a beneficial mix of types: Electric lays waste to everything but Ground and Grass, two things the splash of Flying-type gives Zapdos protection against. In fact, Zapdos may be a bit too strong, because he's incredibly difficult to catch. Save before you fight him, or you may accidentally drive away the only one in existence. Then use Ground or Grass Pokémon (and Rock or Ice techniques, if possible) to knock him as low as you can possibly go without knocking him out. Tangela and other Grassers are especially good here, since they have Sleep techniques to make Zapdos easier to catch. Hypno or Haunter are other good options, as a higher level Hypno or Haunter (around level 50) can use the Hypnosis/Dream Eater combo and reduce Zapdos down to next to nothing and leave him asleep to boot. However, if they are too high of level, they can knock Zapdos out completely. Be forewarned: this could take many tries. This page was last edited on 16 June 2014, at 03:25. This page has been accessed 869,657 times.